Software stocks are leading the tech sector, and broader market, in a strong start to 2019. The XSW S&P software and services ETF has surged 7 percent in the past two weeks, better than the 3 percent gain on the XLK tech ETFand 4 percent advance on the S&P 500. Ari Wald, head of technical analysis at Oppenheimer, says it makes sense to keep betting on the winners. Some of the segment’s biggest names, including Adobe, Salesforce.com, PayPal and Microsoft, trade at an elevated valuation compared with the rest of the market. Salesforce, for example, trades at 54 times forward earnings, well above the S&P 500’s 15 times multiple. Two software stocks illustrate how the group as a whole should continue its breakout, says Wald. Salesforce has added 4.5 percent in the past three months as the S&P 500 tumbled 6 percent. The company is still 8 percent off its October record high. “Also, mobile payments company PayPal, breaking through multimonth resistance in a difficult market tape — we think that is telling. That’s the type of relative strength that we think you want to own,” said Wald. 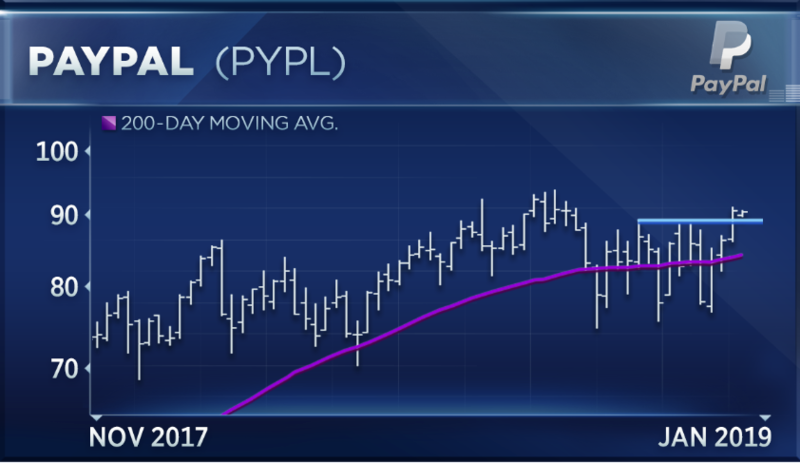 PayPal has had an even better stretch over the past three months. The stock has surged 18 percent over that period in one of the best performers of the S&P 1500 software and services segment. Boris Schlossberg, managing director of FX strategy at BK Asset Management, says Google parent Alphabet is a better bet. While Schlossberg says its advertising business continues to thrive, the real potential is in artificial intelligence. Alphabet has fallen 2.5 percent in the past three months. Its stock is in a correction, having fallen 17 percent from its record high set in August. Any drop of more than 10 percent from 52-week highs indicates correction territory. The company is now listed in the communications services S&P 500 sector rather than technology.